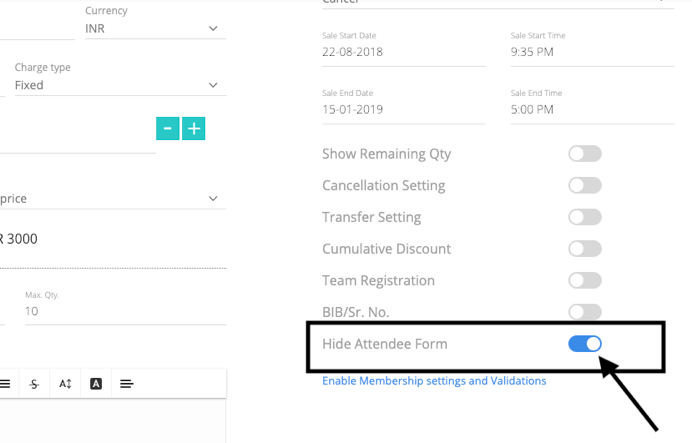 How to disable attendee form for a specific ticket? If an attendee form is enabled for an event whether Event level attendee for or Ticket level attendee form, till now, there was no way, we could disable the attendee form for one of the ticket if needed. How is this useful:- Let's take the case of a Ticket named “Lunch”. This ticket can be attached with a Member ticket or a non-member ticket. Since the member is buying the member ticket and also paying the Lunch ticket, there is no point collecting the attendee information in case of Lunch ticket as system is already collecting the details as part of the Member ticket. This toggle will help hide or show the attendee form of a particular ticket.